A couple of months ago I went to an allotment party (If you haven’t been to an allotment party before, I reccomend it!) and we decorated the trees with lanterns made out of jam jars. It was the best – warm cider, roasting marshmallows, a campfire and sing-a-longs. I don’t know why I ever have parties indoors! 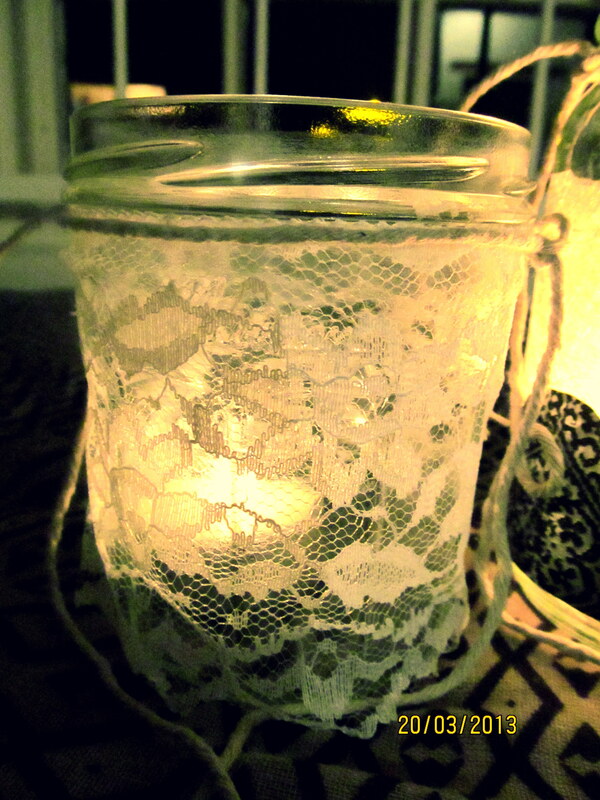 Don’t worry though, jam jar lanterns aren’t just for allotment parties. They can make any space look pretty and atmospheric – indoors or outdoors. I decided to make a couple of lanterns for the house, and here’s how I did it! Step 1: Decorate the lantern. 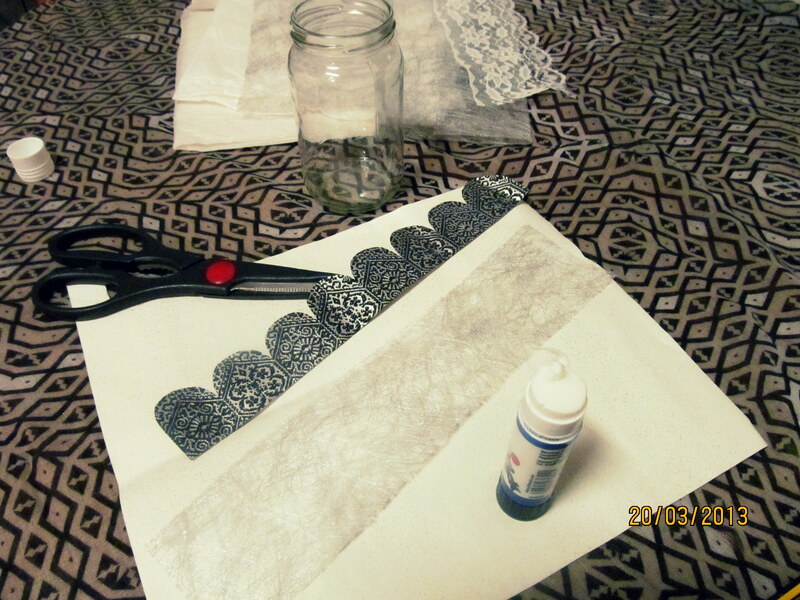 Just cut out your fabric or paper and glue it on! I think the candlelight looks lovely shining through some thin gausey paper, or lacey fabric, but if you are using something thicker make sure you leave some gaps for the light to shine through. There’s so much room here to experiment, you could make a stripey lantern, you could cut out some cool silhouette’s out of black paper, or you could tie some ribbons round the jar. 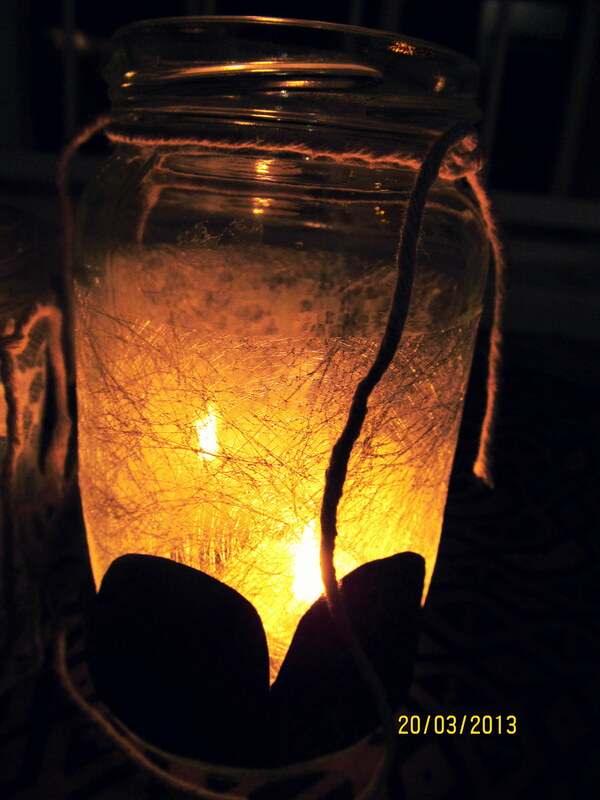 Step 2: Once you’ve done that, you need to tie the string around the top of the jar so that you can hang your lantern up. 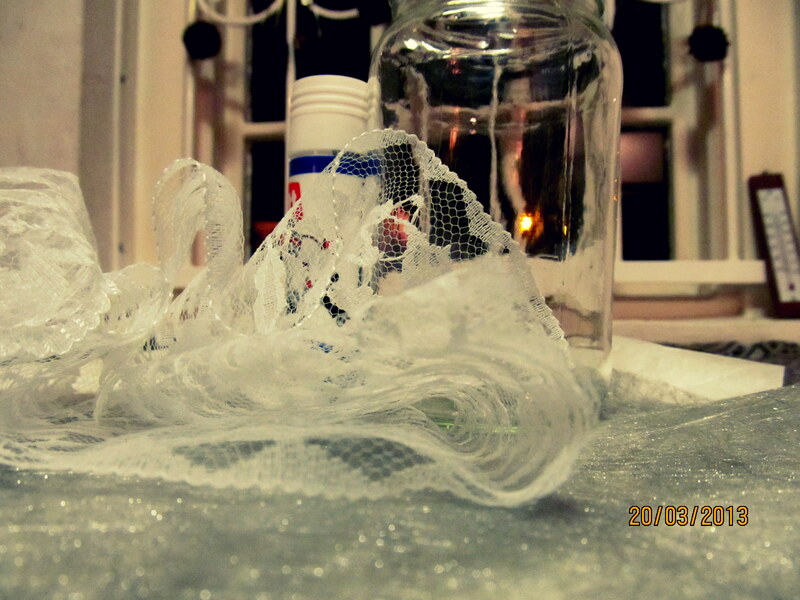 Cut off a long piece of string, and tie it around the top of the jar, leaving one long end. 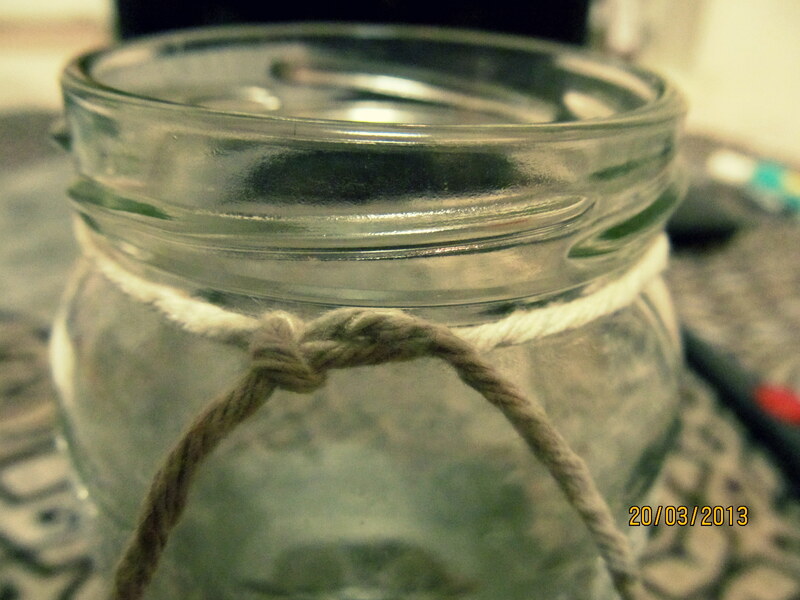 The natural ridge of the jar should hold the string in place. Then tie the left over end of the string to the other side. All finished! Just pop the tea light in, and hang it in the garden or in the corner of a room that you would like ot be a little cosier. I’m sure the weather will be gloriousy sunny soon so that you can hang up your lanterns in the garden! 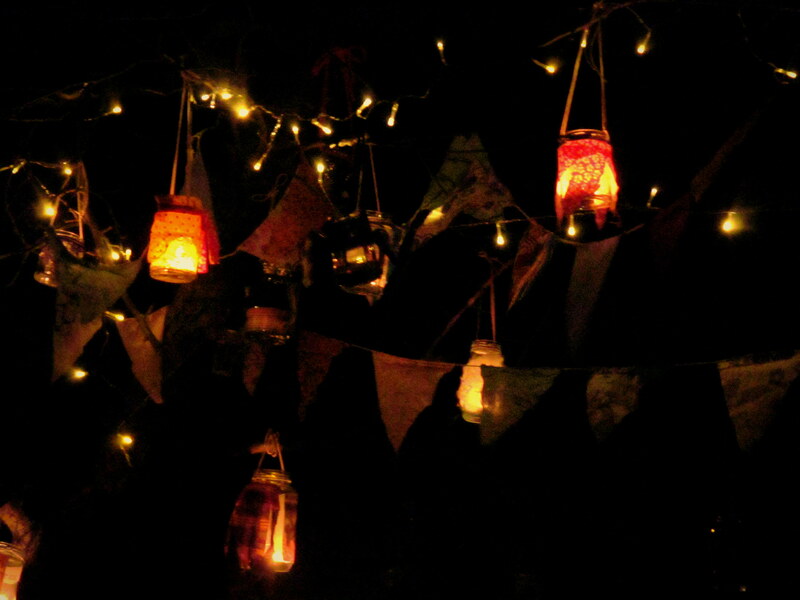 Glass lanterns, bunting and twinkly lights! It looks magical. That party sounds really fun! I love this idea and need to remember it for the party my friend and I are going to give this summer. So easy, and yet really pretty.